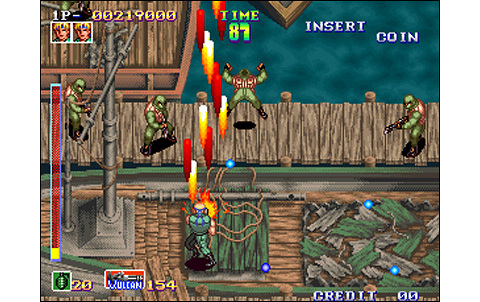 Old-school players, you fell in love with Capcom's Commando and Mercs during your childhood? 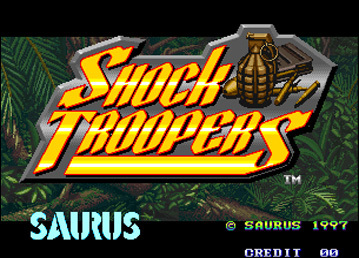 Saurus' Shock Troopers was made for you. 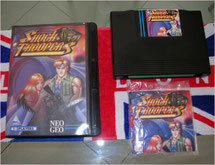 Released on the Neo Geo MVS only (and sadly) in 1997, the title is probably one of the most converted MVS game ever. 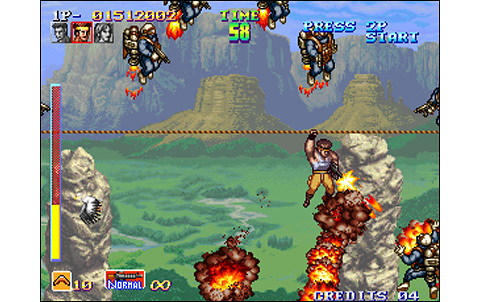 Strong with 346 megs memory, it's part of the same style as Metal Slug, that is to say Run'nGun, but declines the genre in a radically different gameplay. 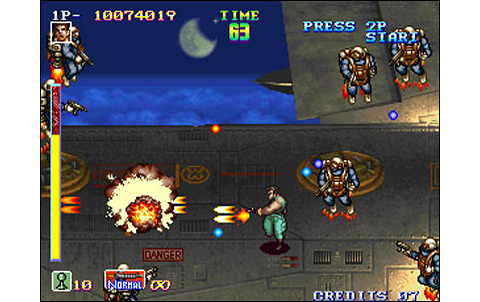 The game mainly uses a vertical scrolling, but this becomes multi-directional in many stages. The view used is 3/4 high, and we have to admit it's a success! 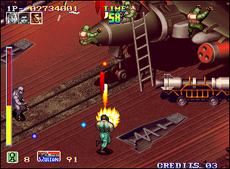 Shock Troopers is a game full of promises. It starts with a punchy and catchy introduction, and a scenario worthy of the A-Team! 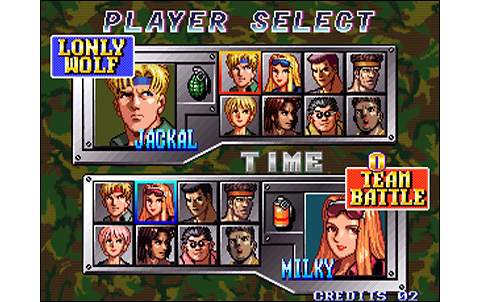 After a short demonstration, you immediately have several choices to make: first, decide whether you go into battle alone or in team. 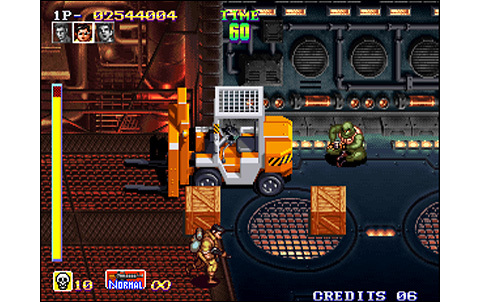 In the first one, you choose your favorite warrior and go for the fight, as in Metal Slug. 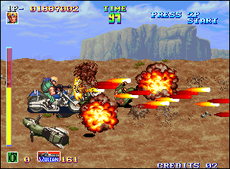 In the second mode, you choose three characters among these proposed: during the missions, you can change your warrior at any time by pressing D.
And immediately, the player feels the smoothness of the controls and the pleasure of play. 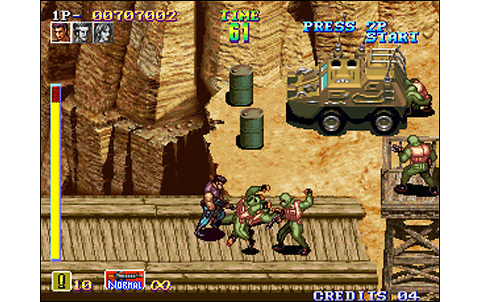 The commands are well thought and the game reveals fast, maneuverable, instinctive... You can stab the enemy in melee, shoot in eight directions, dodge anything that goes... A real Rambo! Many powerful weapons can be collected on the road, such as the Vulcan gun, flame-throwers, tri-directional plasma, etc.. Other items may be picked up, to regain some health, improve your character's speed and score points. All the ingredients seem to be there for a lot of fun! 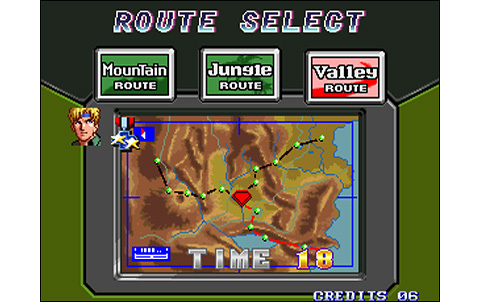 Plus the fact there's three different routes, and a very long adventure to go through: at least fifty minutes to clear. 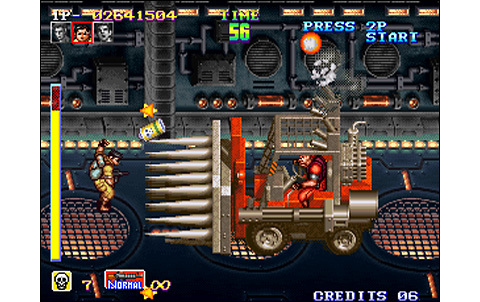 The difficulty is well proportioned and the Bosses give hard times. And even if you finish the game, there still remain two different paths to explore! 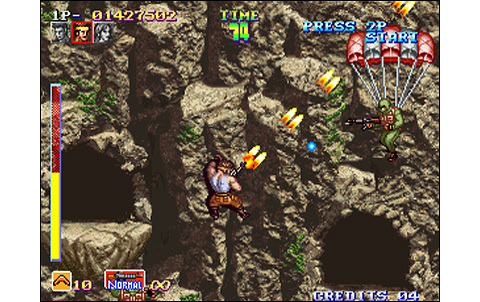 The game is addictive and two-players cooperation shows nice, as when the action is intense the support of a friend is welcome. 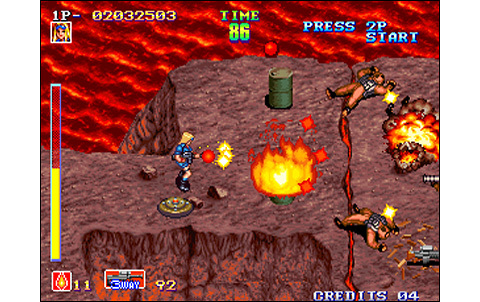 The whole realization is another highlight of Shock Troopers. The graphics and animation are great, with colorful and well-drawn backgrounds, mixing realistic and 'cartoon' in a very own style... Characters and enemies are full of fun mimicries, and the game is even quite bloody! The opponents can be shredded, burned, bullet-riddled... Hmmmmm that's good! 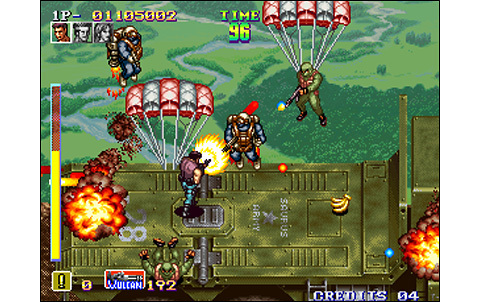 The soundtrack is also very successful, with the hard-rock musics, the great sounds of bullets, explosions and screams piercing the screen. Moreover, stages are varied in addition to being colorful: trek-bike, boat ride, zip line... what an adventure! 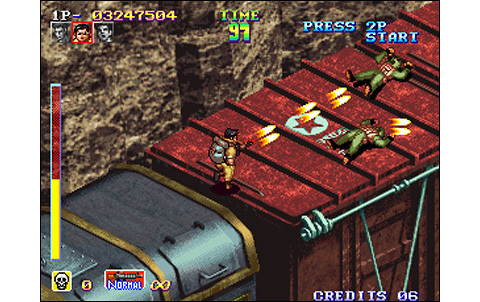 Many characters, different roads, numerous weapons, splendid realization... Really, Metal Slug would better watch out! 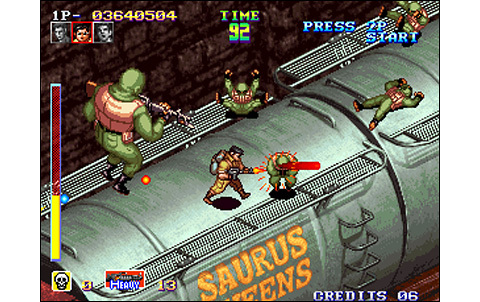 Saurus' game has little to envy to SNK's mega hit , if not its notoriety. 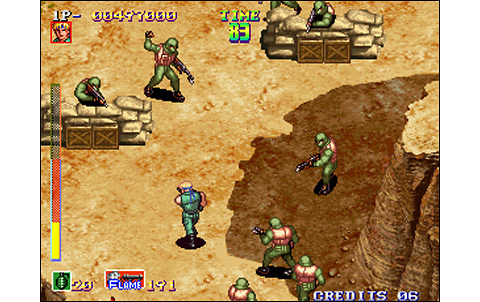 Offering a different approach to the genre, Shock Troopers is a magnificent Run'n'Gun, honoring the machine on which it's programmed. Mixing cartoon and digitalized landscapes, Shock Troopers' graphics have great style, looking like a mix of Metal Slug and Mercs. 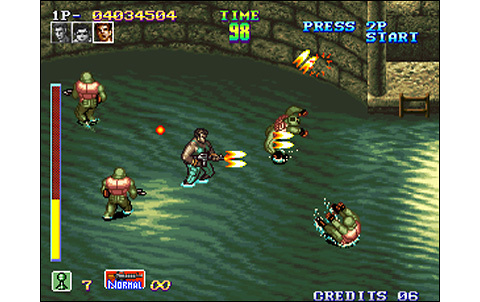 Moves of our heroes are varied and fluid, and the action is dynamic. 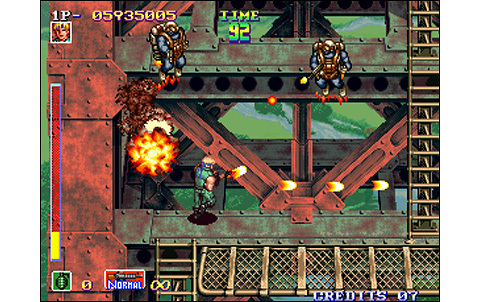 Enemies are sometimes many on screen, Bosses and explosions impressive, but the action never slows down. 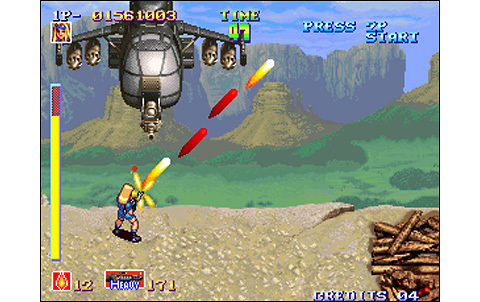 There's hard-rock tunes rocking all over the house, epic sound effects with shoots, helicopters, explosions and everything that goes! Not easy to clear from the first time! Different paths in the game make you come back for more, while the challenge is long and varied. Taking back some Metal Slug ideas, our game adds it a multi-directional scrolling, with even mores possibilities like the dodge, the eight-direction shot and of course the eight different characters! Full of personality and good ideas, Shock Troopers is a good competitor for Nazca's Metal Slug! You'll have to spend between 150 and 200 euros for a quality conversion, that is to say made with a MVS. 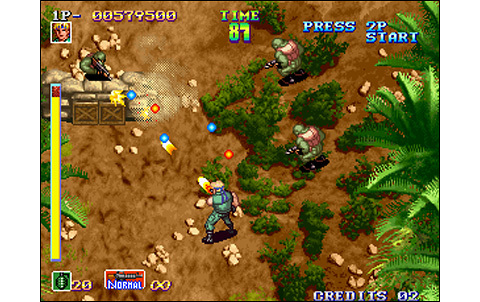 It's some money, but Shock Troopers is a great arcade game, part of the classics that you'll often get out of their boxes to play alone or with friends.